With regular use prevents formation of hard skin on heels! The quality, strength, durability and functionality of the file has been tested and approved by an authorized laboratory. Our Czech company engaged in the manufacture of glass nail files since 2004 and Bohemia Crystal brand products are among the best in the Czech and world market. 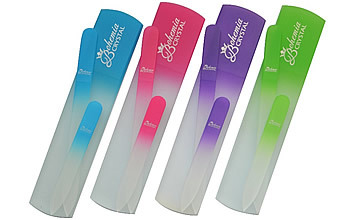 We offer our customers a wide range of glass nail files and glass scraper heels. Production is carried out using traditional hand methods, which, together with subsequent control of finished products provides the premium quality of our products.